I've worked out the T matrix of the tip (position and orientation) with respect to the base frame of a 6 DoF robot for 2 seconds at 1kHz. So the size of the total T matrix is 4*4*1000.
suppose you calculate the positions of your joints $p_i, i=1\ldots6$ using your homogeneous matrices. the thing is now, if you want to have a smooth animation, it is a bad idea to call the plot command each time because it needs some time. The better solution is to update the coordinates of your figure. where you have to figure out the correct child of you figure handle f, you can just hop trough the structure of f to find the right children. Not the answer you're looking for? 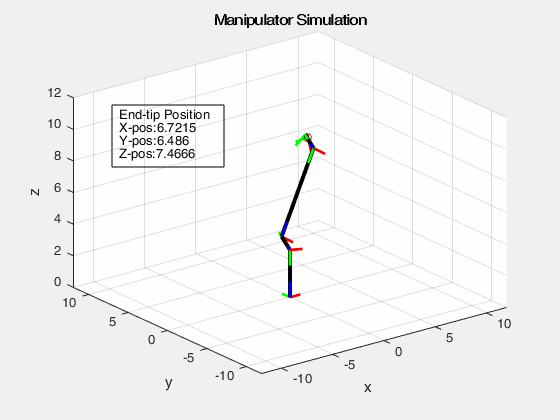 Browse other questions tagged matlab simulation forward-kinematics frame or ask your own question.